When everyone is so busy it can be all to easy to pass ‘like ships’ post childcare arrangements, but today we’ve had a wonderful day spending time with Granny Mook & Lulu for Mother’s Day. We started the day, bright and early, at The Big Cake Show in Westpoint, Exeter. There were some fabulous stands from local producers, and an event like this is a great way to meet small artisan producers of innovative and creative local food and drink. 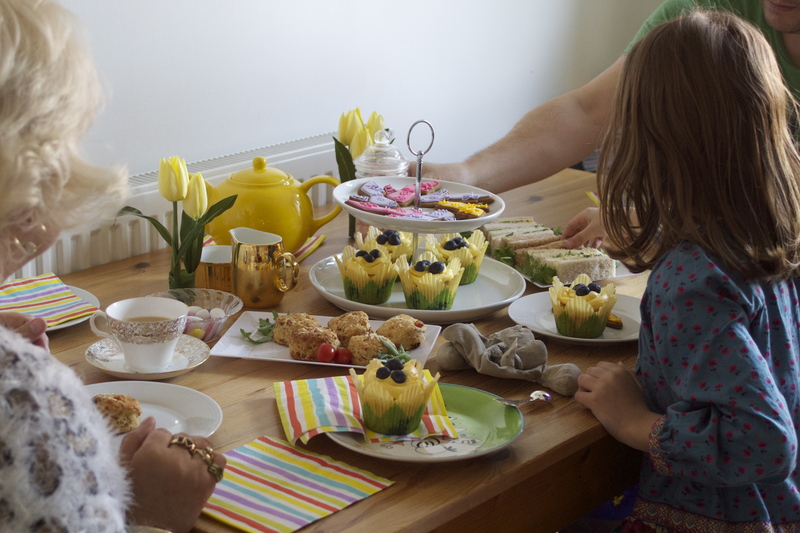 I came away with some fantastically priced vintage teacups, a jug and sugar bowl – all perfect for Granny M&L’s afternoon tea. I would also recommend a visit to The Big Cake Show for the competition cakes alone – themed for the South West. Amazing! We then popped down the road to see the other creative half of Mookandlulusblog.com, Claire, at her friends farm. Mook and Lulu could not have been happier to count eggs, stroke chickens, meet horses and whoop at puppies! Thank you Cathy! We rounded our lovely day off with afternoon tea at Mook & Lulu Towers (Granny helpfully took Mook & Lulu to the park while we set up). 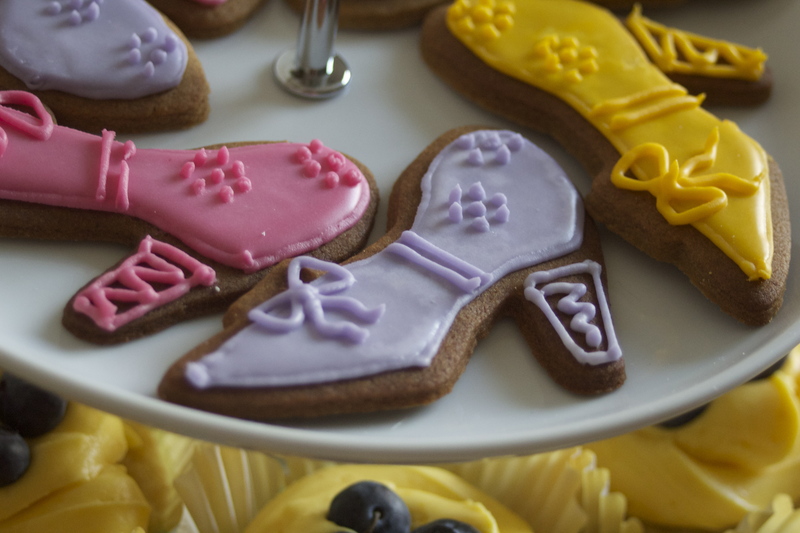 Granny Mook & Lulu was treated to iced shoe-shaped cookies (Granny loves shoes! 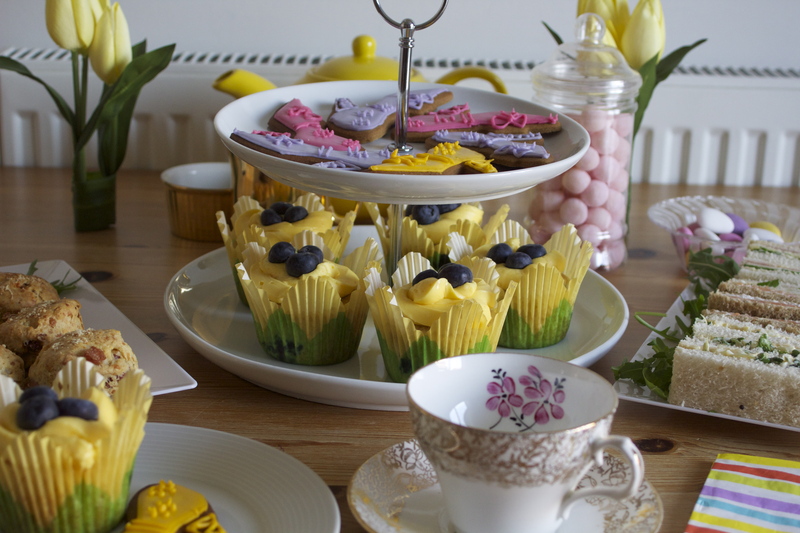 ), lemon & blueberry cupcakes, finger sandwiches, cheese, bacon and sundried tomato scones (fresh from the oven), granny’s favourites – sugar almonds, and tea from a tea pot in one of the vintage teacups. Perfect! Happy Mother’s Day Granny Mook & Lulu! Nanny Mook & Lulu’s turn next! 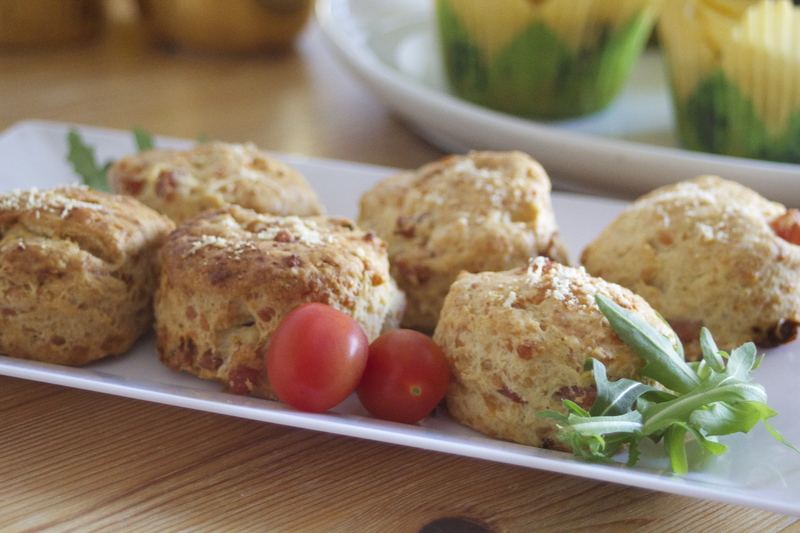 Looking for last-minute-inspiration for a baked treat for Mother’s Day? 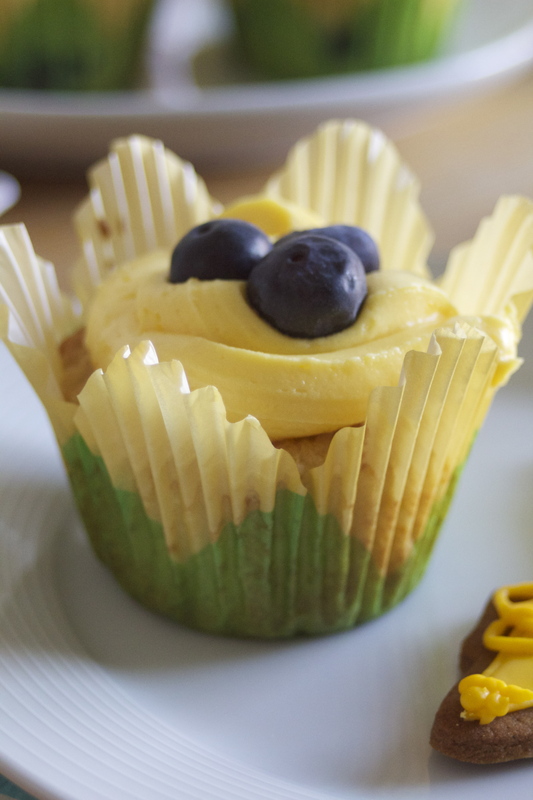 Why not give these fruity Mook & Lulu Lemon & Blueberry Cupcakes a try? There’s still time to nip out and pick up the ingredients and you can whip them up in no time at all. It may have escaped your notice, but today is World Book Day! We love World Book Day at Mook and Lulu’s. It’s a really great way to remind old and young alike how wonderful books are. Many schools sign up to organising book-themed events for the day and these activities can really go a long way to presenting books as a captivating resource, and reading as a fulfilling pastime. Mook and Lulu’s schools have both arranged a ‘Dress Up as Your Favourite Book Character’ event, and throughout the day will be leading the children through a range of themed activities. 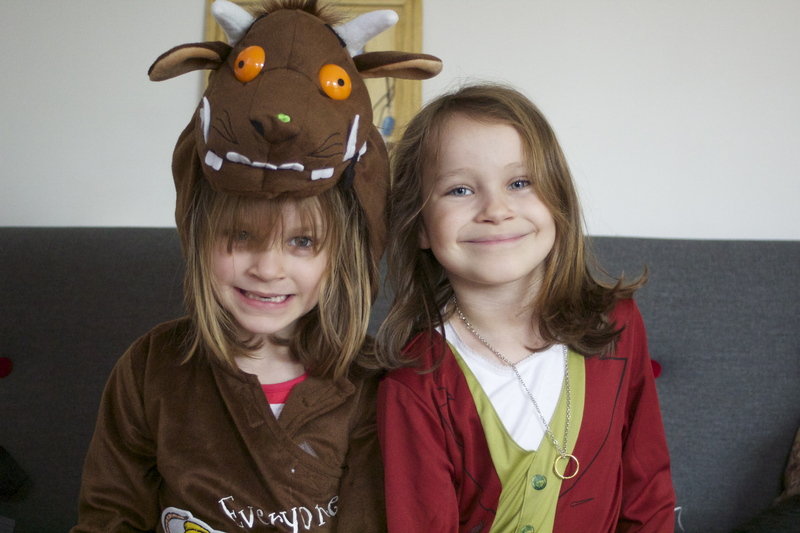 Mook and Lulu both went as their current favourite characters – Mook dressed up as Bilbo Baggins, from The Hobbit, and Lulu could not have been more excited to be going to school as the Gruffalo (She has been counting down the sleeps!). Of course, dressing up is great fun for kids, but I do hope the day has a greater resonance with young readers. The excitement around World Book day also needs to be capitalised on by schools and parents. I was talking with a teacher a couple of years ago, who said she was struggling to explain to the school’s literacy coordinator that there needed to be a review of reading book sets the school was using. As a means of assessing a child’s reading level the books were useful, but the books themselves were not appealing to the children. Mook and Lulu love books, but we know it can be a struggle to get them to read their school books. This is not something new. I could find myself lost in the world of Narnia for days on end – and could be miserable for days after reading the complete set. The only real joy I got from the set reading scheme books was to see how fast I could read them to get onto the next one – always with the hope that the next one would be better. It rarely was. With the easy attractions of gaming consoles, apps and computers, schools and parents need to look at ways of introducing children to absolute joy a good book can bring, particularly in relation to the prescribed assessment reading books. I’m happy to say, that at a parent teacher meeting this week, a teacher told me the school had recently adopted a set of reading books called Project X. These are books with an interactive online element and they are proving really popular with the school’s students. Of course, the teacher and I quietly lamented the loss of appeal the children’s classics had for some children, but if ultimately an interactive book can fire up the imagination of young readers, who can then develop a love of books and reading, then I’m all for it.